Matthew Goodman is the author of the book Eighty Days: Nellie Bly and Elizabeth Bisland’s History-Making Race Around the World. This book was released on the 26th of February and was published by Ballantine Books. Matthew Goodman’s book covers the race around the world between two women journalists of the period and their adventures as they sped around the globe. A little known story about two strong women of the period is brought to life again in this book. His descriptions are wonderful and descriptive, allowing you to feel like you are really traveling with them, across the Edwardian world. I hope you all enjoy his interview and if you want to buy his book, just click the image below and it will take you straight to the Amazon page. What comes across from your writing is an extreme passion for your topic. Are you a big traveler in your everyday life? traveling the world once more. 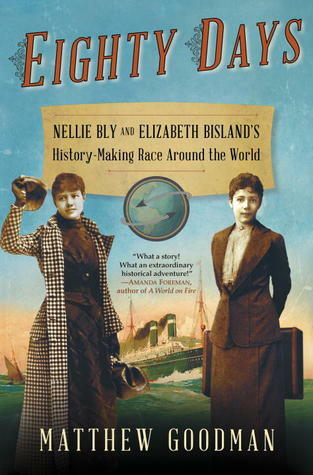 What gave you the idea to write a book about Nellie Bly’s and Elizabeth Bisland’s adventures? the world — one traveling east, the other west. Where would you travel in the Edwardian period if you could? total immersion in “Downton Abbey” has only strengthened that fascination. How would you prefer to travel? By boat? By train? Or by modern cars and aeroplanes? of the train — it all sounds lovely. What was involved in research for your book? Eighty Days is a work of non-fiction. I didn’t make up any of the events presented in it, and I didn’t ascribe any thoughts to a character that he or she himself didn’t claim. I took all of the dialogue in the book from a written source such as a memoir, letter, or newspaper article. I went through years’ worth of newspapers and magazines, read guidebooks, travelers’ accounts, letters, histories, and biographies. I took no liberties with the facts — if a particular day was rainy or sunny, or if a particular ship was early or delayed, that’s how I wrote it in the book. But at the same time, I wanted to tell the story as vividly and compellingly as I possibly could, so that the reader would not just know what had happened on the trip, but also experience what it was like: the roll of the steamship on a storm-tossed Atlantic in winter; a slow, moonlit trip through the Suez Canal; being carried on a rickshaw through the back alleys of Hong Kong and Canton; a snowshoe expedition across Sierra Nevada mountains blocked by snowdrifts twenty feet deep. I wanted this to be a work of history that had all the immediacy, all the emotional impact of a novel. book, Nellie Bly or Elizabeth Bisland? I’ve really enjoyed hearing about how some readers find themselves rooting for Nellie Bly to win the race, while others root just as strongly for Elizabeth Bisland. Of course, as the author I knew right from the beginning who really did win, so I didn’t have a rooting interest in the race. My interest, instead, was in portraying the characters as best I could, to try as best I could to make them as fascinating on the page as they were in real life. If I can reintroduce today’s readers to these two daring, courageous women from years past, then I’ll be very gratified. If you could sit down and chat with anyone from the book, who would it be? Well, of course I would love to chat with both Nellie Bly and Elizabeth Bisland! Over the past few years I’ve thought about each of them so much, imagined each one so intensely in my mind, that I can’t help but want to meet them in real life. But beyond the two main characters, I must confess I would also love to sit and have lunch with Nellie Bly’s employer, the publisher of The World newspaper, Joseph Pulitzer. He adored the works of George Eliot, read widely in politics and history, loved music and the arts, and could recite long passages of his favorite works from memory. One of his biographers wrote of how “his talk poured forth seamlessly, moving with ease from a discourse on philosophy to the merits of a particular piano virtuoso to an analysis of local politics.” Plus he had a yacht. To find out more about Matthew Goodman, visit his website at http://www.matthewgoodmanbooks.com. This sounds like a fascinating book. I want to read it. This was so interesting. I had read the novel, Around the World in Eighty Days (saw the movie, too), but I didn’t know anyone managed to really go around the world in 80 days. I bookmarked this. Thanks for a good read. Sounds like a terrific book. I recently stumbled across the Nellie/Elizabeth story (as well as the other gal who claimed to bicycle around the world) in the course of researching my first historical novel. They are a footnote but they inspire my characters. Will definitely order a copy. BTW I found this blog when searching the Titled American. Sorry I missed out on the etiquette book giveaway. I just read Decorum, an 1879 book on etiquette, online.